In which our heroine searches in vain for someplace safe and healthy to sit. Should be simple enough, right? If you read my last post, you’ll know that, just as Dr. Seuss says, there’s a Bofa on my sofa. First, there’s a lot of green-washing on the question of what is an “eco-sofa.” The vast majority of “green” sofas may have sustainably harvested wood, which is great, and may even have traded some soy-based foam for petroleum foam, which I suppose is good (I haven’t looked at the climate tradeoffs, but it seems likely to be better to use fewer petrochemicals). But they don’t often mention the issue of chemical flame retardants. With a few rare exceptions, you basically have to corner a customer service representative who actually knows the answer to your nutty questions, and even then, they may be reading from a document with more relation to the periodic table than to typical customer service scripts. Nonetheless, the answer, pretty uniformly, is that an idiotic California law called California Technical Bulletin 117 requires anything sold in California (i.e., almost anything sold by any seller of any size in the U.S.), to have these harmful chemicals in it. 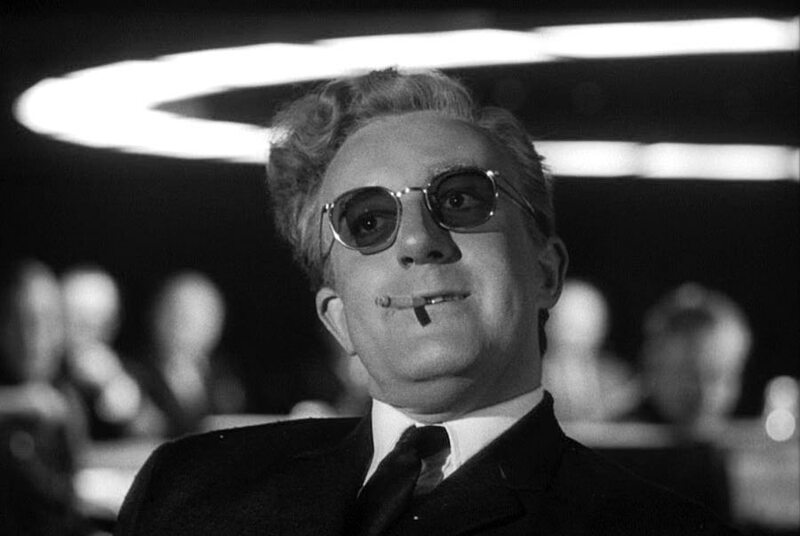 Second, if I read one more post from a green living Web site about the new “eco-fabulous” green design options, I’m going to toss my sprouts. There are, it turns out, a few incredibly pricey options for chemical flame retardant-free sofas, if you’re willing to auction your first-born to get them. Since I only have one child, that’s not really an option. One company requires – and I’m not joking here – a doctor’s note saying you should be allowed to order your sofa chemical-free, because of, you know, your mentally questionable insistence on not wanting to breathe toxic chemicals while watching Game of Thrones. 1) Crate and Barrel and West Elm have a number of attractive options marketed as “green sofas.” But when I called customer service, they said that they complied with the California law by including a “chlorinated phosphate” in the fabric and foam, which sounds like Tris to my uninformed, and admittedly paranoid, ears. (If someone else has a better guess, please let me know.) At any rate, phosphates = chemicals. 2) Despite overly enthusiastic referrals from an eco-design Web site, Overstock was similar, but with even less clear information and even more of a green tinted hue concealing the facts. Even their more environmentally friendly options often only had one “green” thing about them, for example, this “eco-sofa,” which was allegedly green because it “uses environmentally friendly soy based foam that offers improved durability, strength, support and comfort versus conventional foam cores.” To be fair, the one reviewer did say that there was minimal off-gassing, which can’t be a bad thing, but I’m still concerned that they believed the product is more environmentally healthy than it actually seems to be from the information provided. 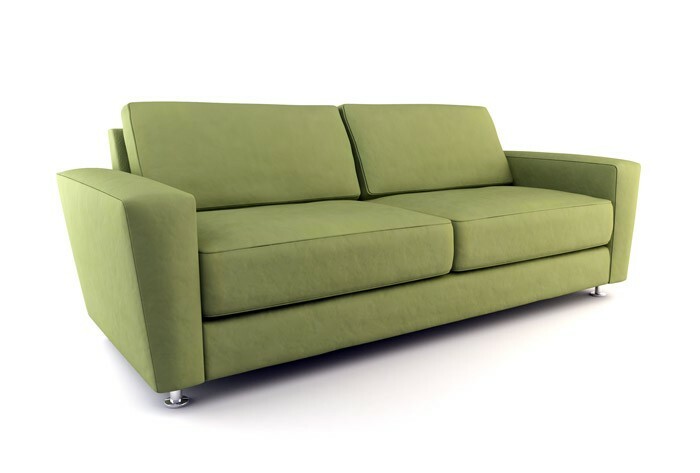 3) An outfit called Greensofas.com seemed promising, given the reasonable prices, despite the California location. But when I called the phone number on the site (there was no way to place an order online), I got the phone company operator saying that it was an invalid number. Hard to place an order there. 5) Broyhill Furniture’s Customer Service representative told me over the phone that “to comply with furnishing and fire safety regulations…all coverings and fillings are cigarette and match resistant.” ‘Nuff said. 6) A couple other companies, such as If Green, were nice enough to talk with me but were no longer producing furniture. Q Collection these days seems to be a fabric-only company. Pure by Ami McKay appears to be a bedding line for Bed, Bath & Beyond, with no sofas in evidence. 7) I even called two custom furniture places in my area. One didn’t get back to me. The other makes knock-offs of designs from other furniture places on the cheap. They checked on the issue, and couldn’t get supplies without chemicals due to the fact that everything came from – you guessed it – California, which seems to be some kind of chemical-cabal couch clearinghouse with a lock-down on the national market. I am very interested in purchasing a sofa, in particular, the Eli in dark brown Hemp, the Mai in crimson, or the Round-d in crimson. What are the prices and shipping charges please? Please confirm that you do not use any chemical flame retardants, including PBDEs or Tris. Thank you for your interest in our furniture line. We pride ourselves in the purity of materials, craftsmanship and love that goes into building our sofas. We do not use any chemical fire retardants in our furniture. In fact, we only use natural and organic materials. Synthetic materials would only be used in case you requested a recycled polyester upholstery fabric. Below I am including a pdf with a more about how we build our furniture and some photos. 2. Certified organic German wool for cushions and smooth backs. 3. Local breed specific wool for back cushions filled with hand fluffed kapok. Let me know if you have more questions and if you would like swatches sent, we work with a broad range of fabric options that are not currently shown on the website. Passionately committed to contributing to a healthier home, community and environment. She also estimated shipping, in a later exchange, at around $500 for curbside delivery. So even the cheapest option from this company clocks in at over 4K. On the other hand, her response was refreshingly thoughtful and thorough. And the designs from this company are modern and stylish, so at least they also look spendy. 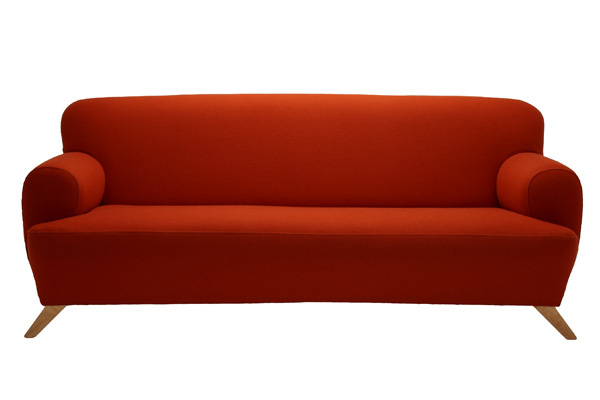 For about the same amount of money, you can also buy a sofa from Dalla Terra. There’s really only one style, plus a matching club chair. There is also a loveseat and sectional. You have the choice of 4 colors of hemp fabric and 4 wooden trim tones. For the sofa, it’s 5K plus shipping. I’m looking to order an environmentally friendly sofa. Would you please confirm that your natural foam latex and other materials in the sofa foam or fabric are not treated with any chemical flame retardants? Thanks so much! Yes, that is correct. There are no fire retardants on our sofas. Please let us know if you have any questions. Helping people live greener & healthier lives since 1997. If you pay a significant up-charge and select “Extreme Green” from the foam menu, you also get a sofa with 100% natural latex on the arms, back, frame, and cushion filling. (Latex is essentially rubber, and I have concerns about whether it’s really the most comfortable thing to stretch out on. In addition, due to a later conversation, I’d also now want to ask whether the latex itself is treated with anything, which I have not yet had time to do.) You can also add goose down inside the seat and back cushions around the latex, to make it softer, again for a surcharge. I asked the customer service fellow, who was very helpful, about the fabric. He said that you can choose to cover the furniture with untreated “organic cottons and hemp,” and that some of the polyester fabrics did have flame retardants in the stain-resistance treatments. There are a significant number of styles to choose from, and a lot of fabrics, and those without flame retardants are indicated in the fabric menu. Shipping would range from $290 to $390 per item. Fiddling around with the site, it also became clear that all of the more reasonably priced items were in-stock furniture that did not include custom options like my eco-upgrade. 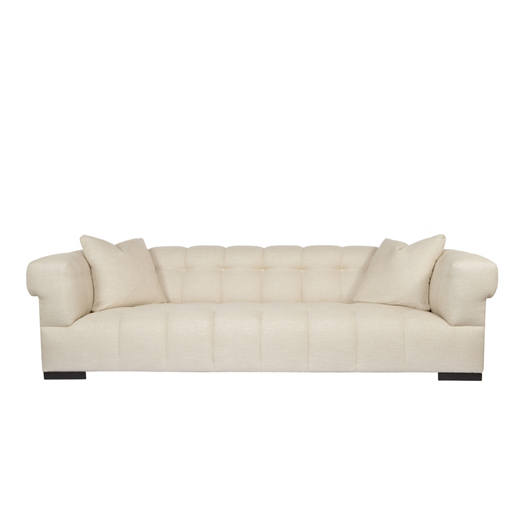 With the upgrade and shipping included, these sofas also topped $3K, and most were above 4K. Option 4: With a Note from Your Doctor, Crazy Lady. Cisco Brothers, which has a “greener” outlook on furniture, allows customers to choose an “inside green” construction option for an up-charge. Inside green construction uses 100 percent wool, organic cotton, and latex. There are a lot of styles and fabrics to choose from. But in order to get the latex free of any chemical treatments for flame resistance, I would need a note from my doctor, which they allegedly keep on file in case there’s a fire in my home and I want to sue them for selling me a healthier sofa. My patient would like to have her toddler’s bodily fluids remain as free as possible from IQ-lowering chemicals. I asked how many times this is requested per year, and she said “five or so, not very often. It’s mainly if you have a chemical sensitivity, or something…” Her voice trailed off, her question mark just hanging in the air. They don’t sell directly to the public, and there’s not a retailer near me, so we didn’t get into pricing. But they do have floor models out in New York City at the enormous style emporium, ABC Carpet, and I might get a chance to pop by next time I’m up there for work, which happens fairly often. Given that an ashtray at ABC is out of my price-range, I’m not hopeful. But at least I’ll have someplace decent to sit while I’m visiting the store. Option 5: The Mystery Chemical that Is, Sadly, Likely Not OK.
A very nice man, Ken Fonville, runs a small eco-furniture concern in North Carolina, Eco-Select Furniture. He seemed genuinely troubled when I told him that a fellow North Carolinian, Heather Stapleton, had identified toxic chemicals in young children that likely come from furniture. He did mention in passing as part of our convo that latex-based furniture degrades under UV rays. He also pointed out that it tends to, as he put it with a slight drawl, “take a set, after a while” meaning, I guess, that it would eventually show (un)shapely indentations. I have no opinion on whether this is true, but it didn’t seem to come from a competitive place. He was merely reflecting on why he didn’t use latex in his upholstery. I liked his furniture because it is covered in leather. With a toddler and stain resistant chemicals off the table, all this hemp coverings business gives me real pause. And his prices are in line with what furniture normally costs. His products use soy blend for 25 percent of the foam, and his lumber is locally certified. He read me the chemical tag for the foam, which indicated that there were no PBDEs, and no Tris. So his might be the Firemaster kind? I’m guessing. Without a test by Ms. Stapleton, we’ll never know. It’s too bad, really. He was that nice. He was an owner who answered the phone and patiently listened while I basically lectured him on the risks to children from flame retardants in his furniture. He’s obviously really trying to get it right. And so I really wish I could buy his couch. What’s the upshot of all this? Basically, we’ve got to cough up enough dough that we’ll have to forgo the next few vacations and then some, or continue sucking it up with old Ikea. I suppose that instead of traveling the world, we’ll just hang out on our new couch, basking in how eco-fabulous we truly are. We’ll have to cancel cable, so we’ll just stare at the wall. Seriously, what do you think I should do? Do you know of any other options for a truly green set-to? Until then, I wish the Bofa would just move over. Just a little bit. There.